User Name Password | Forgot your password? | Forgot your username? Cecilia Avila has got her PhD degree, congratulations!! Hendrys Tobar has got his PhD degree, congratulations!! Jorge Bacca has got his PhD degree, congratulations!! Marc Manzano has got his PhD degree, congratulations!! Dr Lluis Fàbrega and Dr Pere Vilà are the advisors. BCDS co-organized the VI Congreso Internacional en Ambientes Virtuales de Aprendizaje (CAVA 2014). The event took place at the Universidad de Córdoba, in Montería, Columbia on 27 - 29 August. Silvia Baldiris chaired the congress and Ramon Fabregat chaired the Programme Committee. The attendance of the event was 400 people interested in promoting a culture of inclusive education. The event included presentations and invited talks on subjects such as usability and accessibility of digital learning tools and attention to diversity through IT and Massive Open Online Courses (MOOCs). Ramon Fabregat, co-director of the BCDS research group, conducted a research stay at Pontificia Universidad Javeriana (PUJ) in Bogota, Columbia, on 1 - 4 July. Fabregat is an international advisor for ASHIY, a research project carried out by PUJ in the field of personalised learning, and took part in some of its meetings. ASHIY seeks to develop an agent-based platform which provides smart, dynamic and adaptive scheduling of training activities tailored to the individual needs of each student. The project is led by Dr Ángela Cristina Carrillo Ramos, Associate Professor at PUJ's Department of Systems Engineering. Moreover, Fabregat was also a member of the Thesis Committee evaluating PhD candidate Diana Janeth Lancheros Cuesta. The title of her doctoral dissertation was "Sistemas adaptativos de apoyo a los procesos de enseñanza-aprendizaje orientados a estudiantes con discapacidad". In addition, Fabregat delivered the course "Inclusive, accessible virtual learning environment", one of the modules PUJ's MSc in Engineering is made up of. While in Columbia Fabregat also held a meeting with Dr Yezid Donoso, President of IEEE - Colombia and Associate Professor at Universidad de Los Andes. Abstract: Geometric routing is a strategy to send messages among nodes in a topology by using geometric information of their position in some metric space. For single-path routing, a greedy forwarding technique is used. Greedy forwarding brings the messages closer to the destination in each step using local information only. Each node forwards the message to the neighbor that minimizes the distance to the destination in each step (greedy). Some examples of well-known metric spaces are the Euclidean space, the hyperbolic space and a normed vector space. Cayley graphs, a kind of graphs that arise from algebraic groups, has been studied and proposed as a general kind of graphs to represent the underlying interconnection network of data centers. Due to these graphs arise from group theory, it is possible to use algebraic tools to simplify their study for many applications. These graphs are vertex symmetric, which makes possible to implement the same routing scheme in each node of the network, have hierarchical structure, which allows recursive construction, and have high connectivity, which facilitates fault tolerance. Additionally, these graphs have a metric called the word metric. This metric measures the length of the shortest path in the Cayley graph between two elements of the group. Combining the fact that any Cayley graph is a word metric space, we can use its metric to perform geometric routing on them. The vertices in the graph are labeled with the elements of the group and the distance between vertices can be computed efficiently by using a Shortlex Automatic Structure. This structure, which is a set of automatons that encode the global geometry of the graph, can compute the shortest path between any pair of vertices by reducing their labels to their shortlex equivalent word. Our work is focused in the design of a geometric routing scheme for this kind of graphs and to extend its applicability on general graphs by using graph embedding techniques. Ángela Carillo, Pontificia Universidad Javeriana, spent five days working at BCDS in E-learning resources and ASHYI project. BCDS was invited by the "Universidad de la Costa" University (aka CUC) in Barranquilla, Colombia to talk about possible applications of Augmented Reality (AR) and Game Based Learning (GBL) in campaigns of Climate Change Awareness. PhD student Hendrys Tobar from BCDS talked there during the conference held October 24 and 25 2013. During the conference, BCDS research on existing applications using AR and GBL were discussed as well as the games BCDS has worked on. Some memories of the event and the official CUC news report on the event can be found in their official site. October, 14th, 2013, Carolina Mejias has got his PhD degree, Congratulations!! Jose L Marzo collaborates with the Sunflower Networking Group at KSU. In the talk I overview some recent results for optimization problems that originate in optical networks. They deal with optimizing the utilization of regenerators (switching components that regenerate a signal after a certain distance) and ADMs (Add-Drop Multiplexers). The results include design and analysis of algorithms, complexity, approximability and on-line algorithms. Many of the results are derived for a network whose topology is a line, and they can be viewed as scheduling problems. Among the results discussed are (1) an on-line algorithm that minimizes the use of ADMs with a cost of at most 75% more than the optimum (which is best possible) ), (2 an inapproximability result (that is, no existence of PTAS) for the problem of using smallest number of regenerators so as to satisfy each of a given sets of inputs, and (3) an approximation algorithm (with performance between 3 and 4 times the optimum) for the scheduling problem of minimizing total busy time where a machine can process a bounded number of jobs at the same time. The talk will be self-contained, thus no a-priori knowledge is assumed for optical networks or approximation and on-line algorithms. In the tribunal, Jose Roberto Amazonas (U. Sao Paulo, Brasil) and Francisco Jurado (U Lleida) helped Jose L Marzo (local member). In this the talk the concept and the inclusive reference model of the Internet of Things will be presented. It will be followed by a brief discussion concerning its enabling technologies, namely: AIDC (Automatic Identification and Data Capture), network virtualization, cloud computing and semantic web. Some applications related to the three structural axes of the new economy (manufacturing, environment and culture) will be described. Last but not least, the multidimensional and interdisciplinary architectural reference model will by presented as a tool to develop realistic roadmaps for the deployment of IoT-based applications and services. José Roberto de A. Amazonas graduated in electrical engineering from the Escola Politécnica of the University of São Paulo (EPUSP), Brazil, in 1979. He received the MSc, PhD and postdoctoral degrees from EPUSP in 1983, 1988 and 1996, respectively. He is associate professor of the Telecommunications and Control Engineering Department at EPUSP, where he is in charge of optical communications and high-speed communications networks education and research. He held various positions in universities in Brazil, Europe and Asia. He has also led research in partnership with several brazilian, european and north-american companies. He is currently visiting professor at Universat Polytècnica de Catalunya (Barcelona, Spain), Universidad de Antioquia (Medellin, Colombia) and PhD theses supervisor at University Putra (Malaysia). He is the Latin American partner in the European Commission funded CASAGRAS2 project. His research interests are in the area of optical communications, wired and wireless networks, Quality of Service (QoS), remote learning, multiuser detection and Internet of Things. Silvia Baldiris passed her PhD defense on December, 14th, 2012. Jose L Marzo gives the talk: "Cas d’èxit participació de la UdG en PPP FIRE"
Jose L Marzo gives the talk: "Cas d’èxit participació de la UdG en PPP FIRE" during the event: 7é Programa Marc: Programes i Iniciativeseuropees de col·laboració públic-privada. Josep L Marzo gives the talk: "Los mercados de larga cola (Long Tail) movilidad y creación de valor una gran oportunidad." during the event: "Los mercados de larga cola (Long Tail) movilidad y creación de valor una gran oportunidad", Sala Vèrtex del campus Nord UPC. Barcelona. Cátedras Telefónica. Nicolás Bolívar passed his PhD defense on July, 30, 2012. The thesis is entitled "Medium access control messaging scheme for cognitive radio networks" , supervised by José L Marzo. The Broadband Communications and Distributed Systems research group (BCDS, http://bcds.udg.edu) at the University of Girona (UdG, http://www.udg.edu), Spain, is continuously offering PhD research positions in the area of IP networking, mainly in the topics of routing, fault recovery and traffic engineering. Degree in Computer Science, Electrical Engineering or equivalent. MSc in Computer Science, Electrical Engineering or equivalent (*). A background in IP networking, mathematical aptitudes and programming skills. Fluency in spoken and written English. Excellent invention and learning abilities; analytical, organizational and communication skills; the ability of effective and efficient individual work, as well as easy cooperation in a team with supervisors, students, other researchers and companies. Detailed Curriculum Vitae (a copy in pdf). Transcripts of the original Degree academic grades (a copy in pdf). Transcripts of the original MSc academic grades (a copy in pdf). An Excel file extracted exactly from your Degree academic records with the following columns: [course title, number of credits, grade expressed in numerical scale]. An Excel file extracted exactly from your MSc records with the following columns: [course title, number of credits, grade expressed in numerical scale]. List of references including contact information (a copy in pdf). Resum: This seminar provides an overview of Virtual Private Networking services ensuring authenticity, integrity and confidentiality of communication. The presented theory focuses on widely used and IPv6 compatible IPsec implementations. Two practical lab implementations will be carried out by workshop participants: the first one dealing with IPsec/VPN site to site configuration and the second one with a remote user access of IPsec implementation at Cisco ASA firewalls. Configurations will be performed by accessing the remote lab at FH JOANNEUM. BCDS released the first version of PHISON (Playground for HIgh-level Simulations On Networks). Please check the PHISON link: "bcds.udg.edu/phison"
Jose L Marzo, BCDS group, gave the talk: "Robustness against large-scale failures in communications networks" at Kansas State University, Dec, the 1st, 2011. The stay was hosted by Caterina Scoglio, Director, Center for Complex Network Approach to EpiModeling. Dep of Electrical and Computer Engineering. Participación de Ramon Fabregat en "V Jornadas e-Learning en la Formación para el Empleo en las Administraciones Públicas"
El Dr. Ramon Fabregat en la mesa de "Innovación" de las "V Jornadas e-Learning en la Formación para el Empleo en las Administraciones Públicas" ha presentado la ponencia "ARrELS: Realidad Aumentada en Sistemas de Gestión del Aprendizaje Adaptativos para Todos"
The Telecom & Networks Group Research at UAM Iztapalapa and the potential collaboration with BCDS. TERANET (Toward Evolutive Routing Algorithms for scale-free Internet-like NETworks) International Workshop, col-located with the 25th International Symposium on Distributed Computing (DISC) will take place on september, 19 2011 Rome, Italy. The TERANET International Workshop is organized by the EULER research project in which participates BCDS. Jose L Marzo visits Welfare Tech Region in Odense, DK. During the visit he met Welfare Tech Region members and plan eventual collaboration in the area of Telemedicine. 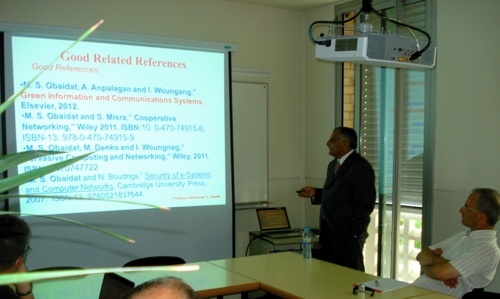 The talk "New Directions in Green Information and Comunication Systems and Samples of our Related Research Works" has been carried out by Professor Mohammad S. Obaidat, Monmouth University, NJ, USA. Seminary Dra. Anna Manolova, Danish Technical Universtiy(June,27th-July,1st). Her main research Interests include Dynamic control of optical networks (ASON, GMPLS); Multi-layer and Multi-domain integration; ASON/GMPLS interworking; Network modelling using Discrete Event Simulations; QoS-based routing and connection provisioning in optical networks; Teletraffic Engineering and QoS Provisioning, Next Generation transport network technologies. Seminary Dra. Caterina Scoglio organized by the Master MIIACS (May, 30th - June, 3rd). Caterina M. Scoglio is associate professor in the department of Electrical and Computer Enginering at Kansas State University since 2005. Her main research interests include the modeling and analysis of complex networks, with applications in epidemic spreading and power grids. Researchers J.L. Marzo, E. Calle and V. Torres attended "II Jornada R+D+i en TIC i Salut 2011" organized by "Parc Científic i Tecnologic" and supported by "TicSalut Foundation" and "UBiFrance". May, 4-5. Prof. Kuo and Nicolas Bolivar work together: "Cognitive Radio Networks"
Prof. Jose L Marzo visits univesities in Columbia. U de los Andes and Distrital in Bogotá. U de Cartagena and Tecnológica Bolivariana en Cartagena ("http://www.unicartagena.edu.co/noticias.htm#n11"). U Autonoma del Caribe, Confederación Universitaria de la Costa and Un del Norte in Barranquilla. BCDS participated in the "INTERNATIONAL SIMULATION MULTICONFERENCE 2010" in Canada. Dr. Jose Luis Marzo attended and moderate the "Co-sponsored by IEEE Communication Society" round table as a General Chair. We present two papers and one poster, follow the link to visit them. BCDS research group organized a workshop on June 16-17, 2010 to present current research interest of their members as well as of guest from similar research groups. BCDS participed in "1era Jornada de bones pràctiques" about Network of innovacion teacher on TIC and teaching. The objetive was the presentation of the network in the meeting and the 9 teachers of the University of Girona were: Ramon Fabregat(Coordinator), David Huerva(Secretary), Marissa Baraldes, Helena Benito, Maria Jesus Gutiérrez, Pilar Morera, Jordi Poch, florencia de la Torre, Alberto Zamora. BCDS attended the AVANTE (Exhibition Of Personal Independence And Quality Of Life) forum in Barcelona. We participated at the "presentation of succesful projects and experiences" with our project AXARM (Aplicación extensible para monitorización y asistencia remota). The committee of ESPANT project (European Study Programme for Advanced Networking Technologies) is working for two days here in the Univ. of Girona. Welcome everybody! BCDS participated in the II Jornades de Comunicació Científica 2.0 at the Science and Technology Park of the UdG. Jose L. Marzo, Ramon Fabregat and David Huerva attended. Dr. Marzo moderated theScience 2.0.1 round table. Thanks to everyone involved. Dr. Yezid Donoso, (Univ. de los Andes, Bogotá, Colombia) is visiting us again this May, as an invited researcher. We will work together in several research topics and he will impart a seminar on optimization techniques in networking (may 19-27). Everybody is invited. BCDS participated in the I Jornada en R+D+i en TIC i Salut a Catalunya at the Science and Technology Park of the UdG, collaborating in 3 events: Dr. Jose L. Marzo, group leader, moderated a round table composed by Josep Roca, Francesc Saigí, Antoni Yuste and Alberto Garcia-Molina. Dr. Eusebi Calle's talked about the TRiEM project. There was also an all day long stand showing the results of the TRiEM project. Thanks to everyone involved. The eFlors project has been developed by our group with the collaboration of the Girona Town Council. This application allows a free localization service of the spaces of theGirona Temps de Flors flower exhibition using Augmented Reality technology in a a mobile application. Esperanza Ayllón, PhD (CUJAE - Instituto Politecnico Superior José Antonio Echeverría, La Habana, Cuba) will be at BCDS the next three months working in the field of learning object repositories. Pawel Kulakowski presents his research and some ideas. At -more info- you can find his slides. Miguel Angel Sicilia, Univerity of Alcalá, spent three days working at BCDS in E-learning resources and sematic web: characterization, representation and instructional design. The BCDS group (ref. GRCT40) is active in two main research areas: Broadband Network Control and Management and Technology Enhanced Learning. The group has led several long-term governmental projects involving other universities and companies like Internet Service Providers and Public Health Institutions. These projects, along with the basic research performed on the group, bring about many publications and contributions on international journals, symposiums and conferences. BCDS carries out its research within the Institute of Informatics and Applications at the University of Girona, and it is part of the DURSI consolidated research group Smart IT Engineering and Services (SITES) (ref. 2017 SGR-1551).